It was on the plane from Bangkok to Katmandu that I first heard rumors circulating that a national strike was underway and that a re-escalation of fighting between royal government troops and the Maoist rebels had resumed in Nepal’s on-again off-again civil war. The Maoist have waged a bloody civil war which has killed more than 10,000 people since 1996. The goal of the revolution to overthrow the monarchy and establish a communist state modeled after the ideas of Moa Zedong. Apparently the whole city was shut down, transportation and commerce forbidden by the Rebels. Skirmishes raged the previous day and a group of rebels was slain by government soldiers. The night before I arrived Maoist rebels had burned 11 buses and even made a group of tourists get off their bus and proceeded to torch it leaving the would-be mountaineers stranded in the countryside for a period of time. After I landed at the airport it indeed was confirmed that the national strike had been declared. There were a few brave locals in dilapidated cars willing to risk breaking the strike for the right price, and so along with two French Canadians I met on the plane we sped off in a beat up Toyota. The airport was surrounded by government soldiers and heavily fortified with barbed wire and guard posts with sandbags everywhere. As soon as we passed the barrier the car was pelted with rocks from protesters angry that the driver was breaking the strike. The old Toyota sped as fast as an old Toyota can go and when one of the Canadians asked the driver to slow down, he responded with “no I must go they beat me if I stop”. The driver flew through the nearly empty streets at one point narrowly missing a pedestrian by literally inches. Later I bid the Canadians farewell as we arrived at one of the hostels frequented by itinerant backpackers, an exciting foray into the chaos that is Katmandu! By day two the rebels agreed to end the strike and the turmoil subsided somewhat although fighting reportedly continued elsewhere. The whole of Katmandu is controlled by government troops but the outlying countryside areas are rebel strongholds. A culture of fear pervades the city, most afraid of Maoist infiltrators. This the driver had earlier explained is why he covered his license plate with a trash bag. Intermittent peace accords have been stuck occasionally since 1996, although most of these have been tenuous at best with the most recent ceasefire falling apart in August. I surmised this is why the price of a plane ticket had dramatically fallen making it feasible for me to finally go to Nepal. 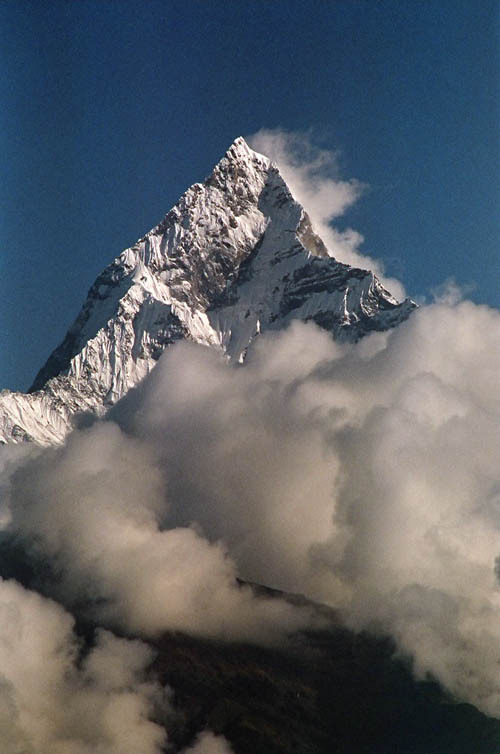 As dreamers will do I have long dreamed of journeying to Nepal and hiking through the Himalayas. A girl I was once close to gave me a book about Nepal several years ago, we eventually went our separate ways but I kept the book unsure if I would ever actually make it to Nepal. It was by this sequence of events that I found myself in Tamel in the heart of Katmandu. My second day in Nepal things seemed relatively normal save the heavily armed soldiers everywhere. I set out from my hostel after renting a Honda motorcycle from a nearby bike shop. As I weaved in and out of the dense traffic through a perpetual haze of exhaust and dust from large trucks and buses clogging Katmandu’s tattered roads I almost wished the strike was still on at least it would be easier riding. Katmandu is a large sprawling city exotic as the name sounds replete with Hindu temples and a series of ever unique backstreets leading to its center Durbar square. Durbar square is a feast of the fantastic for the eyes where the masses congregate and celebrate . Cows wonder the streets and colorful ascetic sadhus with long beards and matted hair meditate in the square in search of wisdom and enlightenment. Temples, pagodas, and shines seem to turn up around every corner. The arteries leading away from the square fill with masses of people browsing sidewalk bazaars. 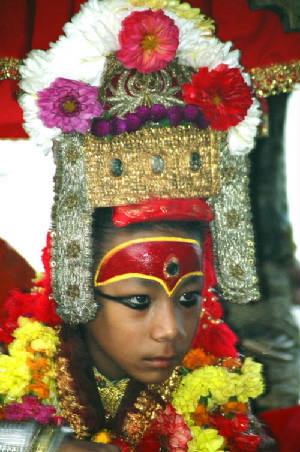 The Kumari Deva or living goddess as she is know is chosen as a child in a complicated ritual based party on clairvoyance, partly physical attributes, and partly on a series of physical tasks in a process similar to how the Dalai Lama is chosen. She is considered to be the physical incarnation of the goddess Taleju and the reclusive teenager is worshipped by Nepali Hindus from all around as a living goddess. Once a year during the festival of Indra Jatra the streets of Katmandu clog with the faithful who come to pay homage and the normally secluded Kumari Deva makes an appearance as she is paraded around through the alleys of the city and Durbar square on a massive gold and red wooden chariot. It was quite by accident that I found myself just a few feet away from her surrounded by thousands of Nepalis and seeming even more soldiers. Later after she arrived near her compound the King of Nepal arrived to receive his yearly blessing from her as royal tradition dictates. By shear luck I managed to sneak into a press area past the soldiers as apparently I looked “press-like” with my camera and large lens. She was later hoisted down from her chariot and just outside her compound she began a prayer ritual, I made my way into the melee and snapped pictures as the scrum of journalists and worshippers clamored around for a glimpse of the Kumari Deva. Once out of Katmandu I traveled down empty country roads past the occasional army checkpoint. Along the way farmers in traditional dress tended to their crops with weathered sickles. Through the millet fields and up steep hills peasants ambled along lugging oversized loads of produce strapped to their backs in large bails. Eventually I rode to a city called Nagarkot high in the hills that ring the Katmandu valley. The ride was refreshing but in the hills the weather turns colder and fog and rain obscure the view of the valley down below. I parked my motorcycle at one point seeking shelter from the occasional heavy downpour and ducked into a random general store and the owner greeted me with a smile. 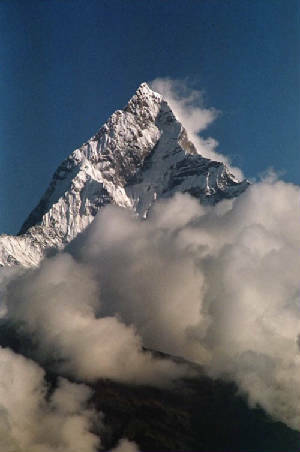 I had read that Mount Everest was visible from the town but as it turned out not much was visible though the thick clouds. As the sun began to set in the western sky the massive whitewashed stupa mound began to take on a warm yellow hue. Tibetans in traditional dress and monks clad in crimson cloaks circumambulated the colossal structure as is the custom in Tibetan Buddhism. Lepers, the blind, and other assorted beggars sat near the prayer wheels with tin pails depending on the charity of worshippers for their livelihood. Other worshippers wearing thick leather aprons prostrated themselves on their knees every few steps. Along the path thousands of prayer wheels spin, the bronze wheels oxidized a dull gold from being constantly spun by hands of the devout. A huge white tower rises high above the stupa with colorful prayer flags blowing in the wind extending down to all corners of the plaza below. Monks from nearby gompas chant the ethereal Tibetan Buddhist mantra “om mani padme hum” in an incessant chorus that seems to ring from every corner of the small town. Small monasteries throughout the town glow with the luminance of thousands of butter candles, their walls thick with dried soot. The expansive ghats of Pashupatinath are crowded with Hindu holy men, mystics, and colorful sadhus performing elaborate rituals and chanting cryptic prayers. Pashupatinath most closely resembles the holy city of Varanasi with its vast array of ghats perched on the banks of the Bagmati river. The dead are cremated on the “burning ghats” near a huge Shiva temple as is the Hindu custom. It was here that I came across a most peculiar sadhu who was clearly on another blissful plane of reality. His skin a ghostly white was completely covered in wood ash from the fires below and his hair was a jumbled mass of errant dreadlocks rolled into a ball on top of his head. It seems these holy men transcend reality by smoking massive quantities of potent ganja literally nonstop (not too much unlike some of my hippie slacker buddies from college). He stroked his disheveled beard as he squinted his puffy bloodshot eyes. He moved with a puzzling affect while rocking his head about like Ray Charles as I snapped a few pictures. Later I was accosted by another sadhu who gave me a tika blessing where a red yogurt substance is put on the forehead for prosperity. Pashupatinath stuck me as a very friendly city, everywhere you go you are greeted with a friendly “namaste” or hello. Random ashrams with other aged gurus in altered states abound and the streets are filled with brilliantly vivid fruit and flower stalls. Patan and Bhaktapur are two towns within easy riding distance of Katmandu. Patan is knows for its central square where flocks of pigeons dance on the tiered Newari roofs above multi-storied temples as locals watch the day pass relaxing on benches lining the streets. Its residents bathe and collect water from huge subterranean wells with intricate water spouts carved into all manner of shapes. Bhaktapur is equally interesting. Potters covered in grey clay spin thousands of pots in the sleepy potters square. The pots are laid on the cobblestone roads before they are baked. The city has an almost medieval feel and the wooden structures and abundant temples inspire the imagination. Hundreds of Tibetan prayer flags strung together wave in the gentle breeze. Each time the flag blows a prayer is said to have been spoken. Sanskrit text covers the flags with the newer flags brighter than the others tattered by the wind, rain, and the other elements. Beyond the flags high above the vegetation line loom the cold shear faced rocky summits of the Annapurna Himalayans rising as high as 26,000 feet above the clouds and into the heavens. Forbidding yet beautiful they collectively comprise an imposing barrier between Nepal and Tibet. I had set out from a tiny village called Sarangkot in Central Nepal and began hiking from village to village along the wet path. The vegetation was often wet because of the rain and this was apparently fertile ground for those pesky leaches. They cover the ground like thousands of tiny short strands of spaghetti. At first I tried in vain to keep them off my shoes. The effort proved exceedingly futile and at some point I just gave up trying to get rid of them as I would have never moved forward if I kept stopping to pick them off my shoes and ankles. Quite the resourceful little blood sucking bastards they attach to your shoes as you walk in the grass and tumble end on end like a gravity-defying slinky somehow miraculously finding their way onto your ankles or into your shoes. The bites don’t hurt so you don’t really notice the sneaky parasites at first but they must secrete some kind of substance that thins the blood as the bites slowly ooze blood for hours even after removing them. Funny leach anecdotes aside though, the trek was breathtaking to say the least. On the path I ran into no other backpackers, my own couple days of Zen. The way people live in the far reaches of the mountains seems a throw back to a much simpler time with thatched mud houses and peasants carrying water from wells in metal vases. Hiking further along the town of Pokara is visible far below through holes in the clouds. After a couple days of hiking I finally made it down to the village of Pokara. Pokara is best described as a magical kind of place that seemingly only exists in the imagination. It sits perched on the banks of a small lake on one side and at the base of the Himalayas on the other. The town is most beautiful when viewed from a small island in the middle of the lake where a lonely pagoda temple sits basking in serenity . The only way to get to the temple is by row boat but the view of the town is inspiring with the snow capped Himalayan peaks rising high above and reflecting into the lake like a mirror. Nearby lies Tashaling, a fascinating Tibetan refugee village. After leaving Pokara I headed back to Katmandu. As there are no direct flights from Dallas to Katmandu my flights took me to Seoul, Korea as well as Bangkok, Thailand, and Osaka, Japan. I spent a few days in each city. More on those and some pics in the link below.